Its not a joke. Vettel is too error prone and Kimi cant win a race to save his life. Thats very frustrating. In defense of Kimi, I think the pit wall threw his win away. He kept Hamilton behind him for awhile. Looks like the US is the best race tyre. If at least one of our cars can get thru Q2 we can split strategy. Meanwhile, Kimi had a nice practice session......error free. Hopefully his session data can help Vettels car. Another mistake by Sebastian, why am I not surprised.. I guess he started to have second thoughts about himself thats when silly mistakes start to show.. Both cars should do the Q2 with US. Ferrari 1-2 in Q and both start with US, at least one red car will lead after first lap with better race tyre. Even with HS I don't see Hamilton jumping them BOTH in the start. And maybe Mercs are too with US, although I'm quite sure that Max/Ric/Both of them will split the Mercs. Bottas seems to be nowhere again. Kimi cant win a race to save his life. Thats very frustrating. Check the above post.....rinse & repeat......rinse & repeat. Well Seb will have FP3 tomorrow. This is surely a must win race though, if we want WDC or WCC. Didn't Kimi use softs for his race sim ? let's hope so, but I have a feeling Merc have more pace up their sleeve. I have faith in Seb. He knows this track and he's exceptional around here. He will be on pole tomorrow. 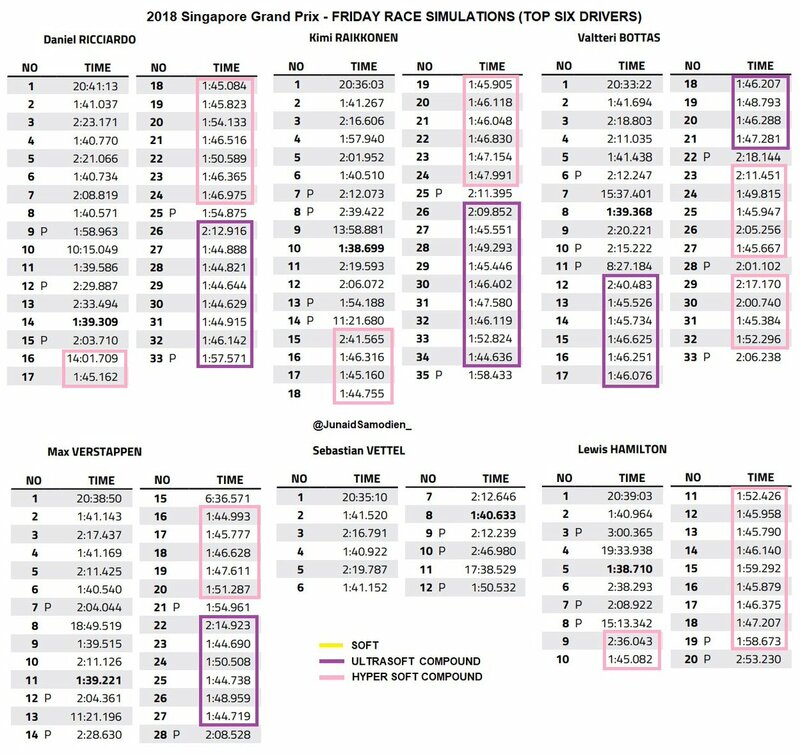 Get P1 in Singapore and you have a good probability of winning the race. Only passing that will be done is in the pits. The start is always scary though. it might be a 2 stopper and with our pitwall and drivers i dont think its over till the last 3 meters on the last lap lol, fingers crossed for seb though, we need an upswing and its started with disaster today, hopefully we were hiding some pace as well, we looked like a monster in monza on race sim then sunday came and we got destroyed in tyres and in true pace. All teams hide real pace on Fridays, so chill out, we've got more in hand. Monza's race pace wasnt truly representative of what the car can do as Seb was driving a damaged car and Kimi's tyres were compromised by Butler Bottas.